Is Your Assignment Due Tomorrow? We Can Help. You have an assignment due tomorrow. But you haven’t even started with the research. You are trying to stay awake with an overdose of coffee so that you can just finish your assignment. Unfortunately the above scenario is just a recipe for disaster. You are feeling sleepy so your efficiency is already very low. You are not alert and you may unintentionally commit the blunder of plagiarism. What usually results is a half-baked assignment which is likely to receive a low or failing grade. In this competitive world, this is exactly the opposite of what you want. Instead of losing sleep and submitting a low quality assignment, we suggest that you seek services from a company which can provide urgent assignment help. We will only accept your assignment if we can meet your deadline. Unlike other websites who will accept payment before they even know if they can help you, we will only accept your assignment after finding an expert. One of our experts will review your requirements so that we know exactly what you want. This process may take up to 1 hour. But still it is much better than paying immediately in blind hope. Sometimes, students’ expectations are simply unrealistic, for example, they want us to complete a 10 page paper in 2 hours. We politely refuse these assignments as we do not want to tarnish our image by submitting a poor quality work. We do not charge a bomb. We have heard of cases where students paid in excess of $150 per page for urgent assignment help and received unintelligible garbage or absolutely nothing in return. So beware of these fraudulent companies. We are able to charge you a reasonable amount even if the assignment is due in a couple of hours only because we have a wide pool of assignment experts. This does not mean that we are the cheapest service provider, but we will simply provide you the best value for your money. We provide LIVE rework service. There are many assignment writing companies who will accept your urgent assignments but will desert you in case you need rework. This is something you will never experience with us. We provide 24/7 customer service. If you have ordered an urgent assignment, we make sure that your queries and rework requests are answered in a prompt manner. We want you to be 100% satisfied with your assignment even if it is an urgent assignment. How can I get immediate assistance on my assignment due tomorrow? Contact us through live chat or phone (+61 2 8006 7650) or fill out this simple form anytime. Our friendly customer service representative will be glad to assist you promptly. Once we have received your requirements, we will find a suitable expert to do your assignment. We will send you a quote only if we are sure of meeting your deadline. Once you decide to go ahead with us, proceed to make the payment to confirm your assignment. Upon successful payment, our expert will immediately start working on your urgent assignment. We understand that you will be anxious during this entire period, but we request you to remain calm and let our expert do his job. We assure you that you will receive a top-notch assignment before your deadline. 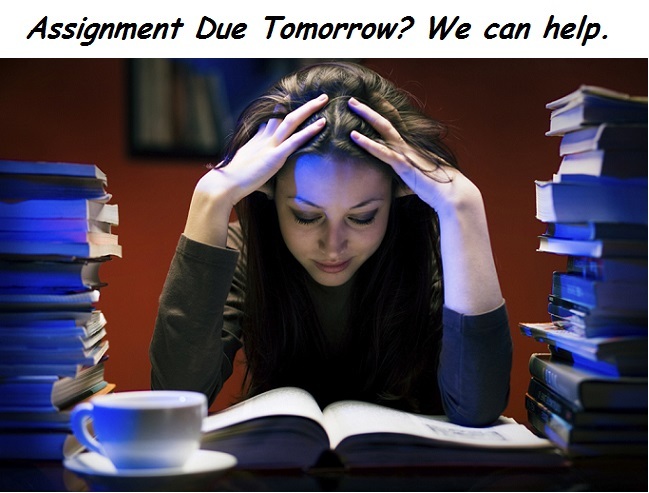 Our overnight assignment help service is a boon for students who had completely forgotten about their assignments and now have an urgent assignment due tomorrow. With us, you can expect complete honesty and reliability. If we accept your urgent assignment, we will not compromise on its quality. After all, that is why you pay a premium on urgent assignments. So if you have an urgent assignment due, contact our live chat representative or fill up our online form for custom assignment help right now. You will be surprised at how quickly we respond.